A Ukrainian-born pianist was barred from playing at Canada’s Toronto Symphony Orchestra (TSO) for expressing views on the situation in Ukraine via Twitter, according to the soloist herself. The move led to a social media storm tagged #LetValentinaPlay. In the statement, Melanson seems to be referring to Lisitsa’s Twitter posts, in which she expresses her views on the situation in Ukraine. Some of her work included translating Ukrainian-language websites and eyewitness accounts. “I became really good in unmasking fakes published by Western media,” Lisitsa said. After expressing her views, Lisitsa claimed to have received numerous death threats. Lisitsa revealed that TSO offered to cover her entire fee for the canceled program, if she chose to stay silent about the reason behind the decision. “They even threatened me against saying anything about the cause of the cancellation … If they do it once, they will do it again and again, until the musicians, artists are intimidated into voluntary censorship,” she wrote. The reaction on Twitter was massive, with the hashtag #LetValentinaPlay surging in popularity and thousands of supporters speaking out. 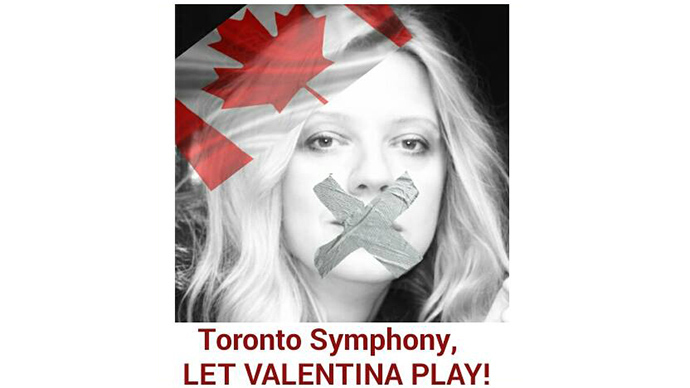 @ValLisitsa wrote an email to the @TorontoSymphony hope they have a deluge of emails about this Shameful #letvalentinaplay Goodyear? Pfft! Lisitsa was born in Kiev into a Russian-Polish family. Her family came to the capital from Odessa, Ukraine. She immigrated to the US in the 1990s. Her career was successfully launched through a YouTube channel, which now has received around 43 million visitors. Lisitsa now travels around the world performing classical pieces. Kiev launched a military operation in Donbass in the southeast of Ukraine last April after locals rejected the new coup-imposed authority in the capital and demanded more autonomy. Since then, the death toll has climbed to over 6,000, as the conflict between the Ukrainian government and the self-proclaimed People’s Republics of Donetsk (DPR) and Lugansk (LPR) continues. One of the major latest developments was the peace deal brokered on February 12 by Russia, France and Germany between the sides of the Ukrainian conflict, which led to a decrease in hostilities. The agreements were signed in the Belarusian capital, Minsk, and called for a ceasefire, the withdrawal of heavy weaponry and prisoner exchange. However, some have criticized the lack of progress since the agreements were signed. Russia’s Foreign Minister Sergey Lavrov said the political dialogue between Kiev and the rebels has not even started. The issues, “which were agreed in Minsk and aren’t at all implemented include amnesty, special status [for Donetsk and Lugansk], lifting of the economic blockade and the launch of the political process,” Lavrov said.